Review in a Nutshell: The Assassin’s Blade is a must read for any Throne of Glass fan, giving important insight and fleshing out the fantastic world. 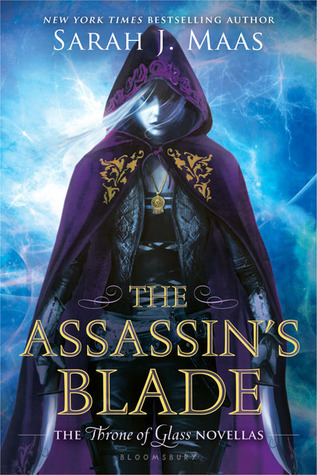 The Assassin’s Blade includes five novellas taking place in the world of Throne of Glass, following everyone’s favorite assassin, Celaena Sardothien, as she goes on five different missions. These novella’s show a part of the setting that isn’t portrayed in the first two Throne of Glass novels. Sarah J. Maas, once again, writes beautifully. Her prose is elegant while also maintaining a fast pace for the epic action scenes, which there are quite a few of in this collection. The plot in each story varies, but they all connect and tell Celaena’s story of what happened leading up to where she was at the beginning of Throne of Glass. Despite knowing how it will end, Sarah J. Maas still keeps the story interesting and throws a few twists. These novella’s lay down the groundwork for a lot of things to happen later in the series, as well as explain a few things that weren’t clear in the first two novels. Some of the novellas are more interesting than others, but none of them are boring, something I don’t see in many novella collections. There are so many amazing characters introduced in this book! First off- Sam is amazing and I cried so hard while reading. Going into this knowing how it ends still didn’t prepare me for what happens. I should have known better. You get so attached to all of these characters! While the individual stories are short (true novella length), each character is given so much depth and personality. This collection also really adds to Celaena’s character. She was definitely a well rounded and developed character in the first two books alone, but The Assassin’s Blade continues to add layers to her personality and to her history. Cons- This book broke my heart. If you haven’t picked up The Assassin’s Blade you need to do so immediately! This collection of novella’s adds so much to an already fantastic series.